David Mclean passed away while I was on vacation. It is a sad time for all horticulturists in South Florida. He was a ubiquitous fixture in everything to do with plants. Until recently was a guest speaker at most plant groups, library chats, park gardening series and more. He sold plants at most plant shows all over the tri county area. 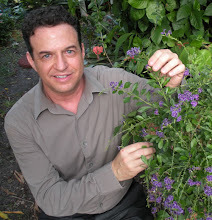 While teaching horticulture at Broward College for over 40 years, he created a monthly plant group opened to the public as well as college students. There was always a great speaker, a plant auction and upon completion a dessert buffet supplied by the attendees. The group met at the Broward County Extension Office for years and then later at the site of his nursery at Trinity Church in downtown Fort Lauderdale. He was a brilliant horticulturist, who had a passion for teaching and sharing his everlasting curiosity of plants. He had a sharp sense of humor, was opinionated and blunt. Never boring. Over the years I purchased plants from his nursery. I had a wonderful potted allspice tree for years. Upon returning from my vacation, the allspice tree was dead. It had lasted for years on all my other vacations. Goodbye David and goodbye allspice tree. You will be missed. Penny Bullard, his wife still operates an amazing restaurant on the grounds of the church. David created the edible landscape at the restaurant and I wrote about it. Here is a link to the article. Here is a link to his obituary from the Fort Lauderdale Sun Sentinel. Every year the Fort Lauderdale Orchid Society hosts an amazing show and sale. The displays are absolutely spectacular. Orchid growers and orchid societies haul in a vast array of accoutrements to present their orchids. Gigantic foliage plants, huge berms, lights, music, mulch, rock and so much more are artistically arranged to create mini paradises. There are throngs of photographers taking selfies, their friends, or just the displays. The show is judged and there are many awarded orchids to view. Having been going on and off for over thirty years, and feeling a bit under the weather, I was not planning on attending this year. A receptionist and orchid enthusiast at one of the nursing homes I practice Horticultural Therapy at asked me if I was going this year. I told her no, and she said, "It is going to be great and you are buying a ticket now." None of my friends were interested in going for a multitude of reasons, so I attended myself. I went to Holiday Park, where it was held and was surprised not not see crowds leaving the auditorium with shopping bags full of orchids. At every show, no one leaves empty handed. People walking in did not look happy or as well dressed as the orchid enthusiasts of years past. There was a negative energy flowing. As I walked there was a sign stating it said if you buy a ticket to get in you get a free pass for another gun show. Something seemed weird and sure enough, I had the wrong week, and it was a gun show. No wonder no one was smiling. I went back the next weekend and sure enough there was excitement in the air. People were smiling, carrying their beautiful orchids and looking refreshed and invigorated as they left the hall. The show did not disappoint and I naturally had to buy some orchids. I walked around, toured the show, chatted here and there with strangers, met a few acquaintances. The president and board members of the show came up to me and said hello. I hate going to events alone so it was nice to see some familiar faces. I had a marvelous time at the show and was happy to attend as always. I felt happy and refreshed leaving the event. That day I came home and shot a video of the baby bare root orchids I bought and how to plant them in a container. After the video a few weeks later I added some lava rocks to keep them in place so they would not fall out. An epsom salt foot bath soothed tired, sore feet. A hot tottie was given for a cold before bed. A hot tottie could have been a whisky shot, or an elaborate concoction of warm milk, and egg and whisky. The were astounded when a doctor prescribed garlic pills to lower blood pressure. What is old is new again. Old fashioned cures that were once considered old wives tales are now medically proven to be beneficial. Many cures are now available at the local drug store, from pharmaceutical grade olive oil pills to herbal teas and epsom salts.